(Stateline) — For decades, cities and states have tried to create jobs and boost their economies by luring out-of-state employers. Now some areas are trying to attract workers — one worker at a time. Starting in January, programs in Vermont and Tulsa, Okla., will pay people to relocate to those places if they work remotely. Other resident recruitment strategies in Florida, Kansas, Maine, Michigan, Minnesota and Vermont include weekends that tempt tourists to stay, discounted rent, student loan assistance and free land. Farquhar sees “pay to move” as “somewhat of a desperate plea: We need educated people to come here and stay here.” He cautions that little research has been done on the effectiveness or sustainability of the strategy. But in a state that is desperate for more people — Vermont has about 620,000 residents, with about 45 per cent of them retired or about to retire — officials are willing to give it a try. Vermont Gov. Phil Scott, a Republican, signed the Remote Worker Grant Program in May. The legislature provided $500,000 (all figures U.S.) over three years to reimburse expenses of remote workers from other states who relocate. Tulsa also is focusing on remote workers. Tulsa Remote will pay workers who pass a stringent online screening process and live in Tulsa for a year $10,000 in cash instalments. Workers also will receive free membership in a co-working space and housing discounts. The pilot project is funded and administered by the private George Kaiser Family Foundation. No public funds are involved. Tulsa’s population, about 400,000, has been flat for decades. The foundation was looking for ways to attract new talent to the city, said executive director Ken Levit. The foundation has already brought 50 artists and writers to Tulsa for a year or more through the Tulsa Artist Fellowship, which pays stipends and provides free rent. Ben Winchester, a rural demographer at the University of Minnesota Extension Center for Community Vitality, said people who leave small towns to attend college often want to return to their hometowns when they reach their 30s and 40s. For many of them, the challenge is finding a house. Harmony, Minn., is an example. The Great Recession led to a years-long halt of construction in Harmony, population 1,080. In 2014, the local economic development authority started offering incentives of $5,000 to $12,000 to build houses, depending on the expected taxable value of the building. Harmony Mayor Steve Donney acknowledged that the program “was very slow to take off.” So far, the town has paid out about $62,750 and has committed to paying out another $20,000 for eight buildings. This year, for the first time, the town has collected some new property tax revenue — about $2,200. Marquette is within commuting distance of the larger cities Salina, McPherson and Hutchinson. Two years ago, Maine expanded the opportunity tax credit, which had been limited to graduates of in-state schools, to graduates of out-of-state schools who live and work in Maine. Maine Gov.-elect Janet Mills, a Democrat, promised in her campaign to simplify the complicated tax credit system and to invest in a “Rural Return Scholarship” to give young people from rural Maine incentive to return to their hometowns. 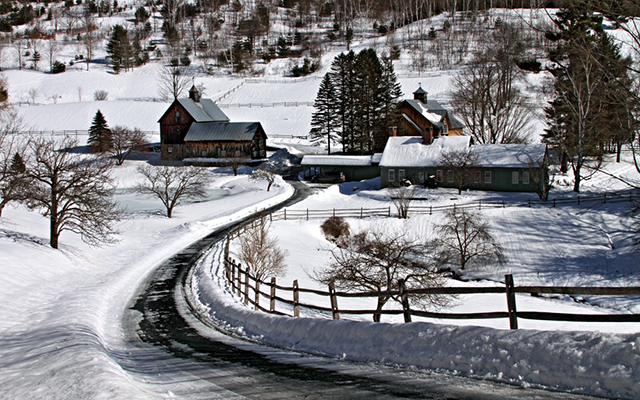 Four Vermont communities have sponsored Stay-to-Stay weekends. After a Friday night welcome reception with local leaders, tourists explore the area on their own before meeting Monday morning with entrepreneurs, realtors and potential employers. The Vermont tourism and marketing department is collaborating with local chambers of commerce and young professionals groups on the initiative. But Posley’s story also illustrates some of the challenges that Vermont faces. She is African-American, and Vermont is 93 per cent white. Vermont and other New England states are scrambling to find ways to attract more people of colour and help them feel at home. The Vermont tourism department highlights the state’s status as the first to abolish slavery and promotes a trail of African-American historic sites. And the website iamavermonter.org helps people of color connect and tell their stories about moving to and living in Vermont. Posley found a job as a night auditor working the overnight shift at a ski resort, where she balances the day’s income and expenses and handles the front desk. But she hasn’t settled in yet. She finds Vermont’s housing costs higher than Mississippi’s, and her job pays less than what she made there. She loves seeing the stars at night — but not the 40-minute drive to the laundromat.